I've been trying out mobile phone based geo-locator applications like Foursquare, Gowalla and Loopt - for work, I swear! Basically how they work is, when you arrive at a location you can "check in". There are all sorts of games associated with this... You can earn badges, become mayor, etc. But the real value lies in retailers, restauranteurs, event promoters and more offering their repeat customers special deals and discounts. One coffeeshop I visited in Austin gave the mayor rights to design their own menu item. At Zola Wine and Kitchen (and all of the spots in @ChefBryanDC's empire), you get a freebie on your 2nd and 5th checkins- and the mayor gets a free glass of wine. Everyone from Starbucks to Sports Authority to Bravo TV & Sephora are exploring its usage. So it's worth checking out. But, especially as a girl, you've got to be safe. Letting folks know your location means people can find you. And that's not always cool. So here are a few rules of the road I've set for myself that might be helpful for you. 1) Never check in at home. You don't want to register your home as a checkin, especially not with an address. Not only will you be telling that address to your friends, it could be accessed by shady characters. 2) Be careful checking in places when you are flying solo. Since I still like the discounts, I check in upon departure instead of arrival. 3) Keep your circle tight. If Facebook are your friends and family and Twitter are your followers, your Foursquare friends should ONLY be people you know and trust - and that you'd be cool with them showing up where you are. 4) If you are concerned with sharing your location, you can "hide your whereabouts" or choose to not cross-share that information across Twitter and Facebook. 5) Leave tips! When you visit locations you like, leave a tip on Foursquare and tell people what you love about it. I like leaving my favorite menu items at restaurants or giving kudos for great service. To get started, download one of the apps to your mobile phone and register. 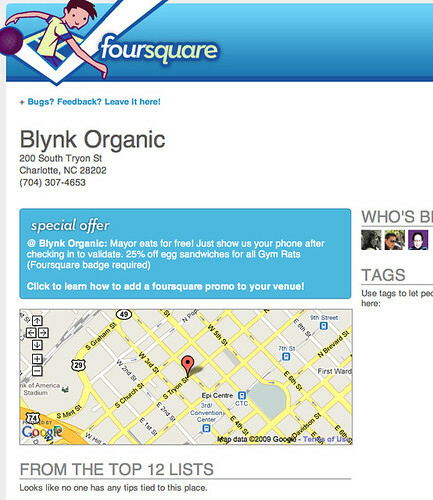 Scan your email, Twitter or Facebook and decide who you'd like to add to your Foursquare circle. Start checking in at places and checking out the tips others have left. UPDATE: Mashable reports new Foursquare app called Avoidr that allows you to block those you don't want to find you. Have other tips? Leave em in the comments for others to learn from. Excellent tips. I know someone who checks in at home every night. SINGLE GIRL CHECKING IN TO HER HOME ADDRESS ON A PUBLIC WEBSITE. Soooo not smart. I don't even have "friends" on Foursquare... I guess I don't see the point of that since I mostly use it for the reasons you listed here. I was also happy to see that I could de-select all mayoral announcements etc from going to Twitter (of course, it took me a while to figure that out)... nothing like alienating one group in order to hang out with another! Great tips! I also swear by these. While I sometimes post my whereabouts on Twitter, it's only when I actually want to share with the world where I am (a tech event, concert, etc) otherwise it's a restricted Foursquare friend list and only visible to them. Maggie, that's so true. Not everyone realizes how public these things can be. If you have friends that are using these in an unsafe way, you should definitely let her know. No amount of badges are worth stalkers. Great post! I totally agree with your tips- for both girls and guys alike. Sometimes I see the "home" check-ins and I think to myself "eeeeeeeeeek!" - like you said, totally not worth it!! Great post! I don't understand people who check into their own house. Like so and so just checked in to so and so's watering hole... it's your backyard and now everyone has the address... and of course you're the mayor of your own place! a) it's not safe b) it's silly! Good tips. Especially for girls, you can't be too careful these days. I have a couple friends that not only check in at their homes, but also at friends' homes(!) and I really wish they wouldn't. Heck I am a guy and I won't even check in at my home. Too many crazies out there.